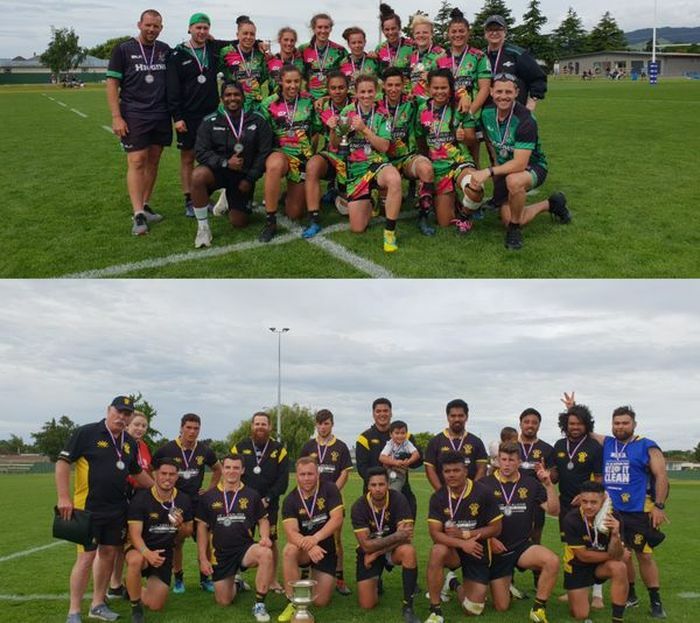 The Wellington men’s and Manawatu women’s successfully defended their Central Zone 7s titles today at the annual qualifying tournament for the Nationals in a fortnight. In the finals, Wellington beat Hawke’s Bay 14-7 and Manawatu defeated Wellington 22-10. Manawatu beat Taranaki in the men’s playoff for third and fourth and Hawke’s Bay defeated Taranaki 27-7. The order of finishing determines seeding for the Nationals. All four women’s teams entered in the Central 7s qualify for Nationals, but just five of the seven men’s sides. In the all-important men’s playoff for fifth and sixth, Wairarapa Bush beat Wanganui 35-7, after leading 21-0 at halftime and then 28-0 early in the second half when Jack Eschenbauc burst through. Epeli Rayaqayaqa scored again and the Masterton team were packing their bags for Nationals at Tauranga. Home side Horowhenua-Kapiti also missed out. The men’s final saw Wellington skip to a 14-0 lead by halftime, on the back of tries to Piri Paraone and Romu Seilebu, running on to passes by Pakai Turia and Sheridan Rangihuna respectively. Hawke’s Bay had shown dash and pace all day, and they pressed hard for a reply. Former Wellington player Zach Donaldson came on and scored the try they needed. Hawke’s Bay then went desperately close to scoring a second try that probably would have evened it up, not once but twice. They were in for all money but a try-saving tackle over the line by Piri Paraone saved the day, followed by a knock-on close to the whitewash from a subsequent play. Previously, Wellington had beaten Manawatu 24-5 to win one men’s semi-final and Hawke’s Bay had defeated Taranaki 33-19 to win the other. Wellington laid on three first half tries to win their semi-final, Daniel Schrijvers, Kemara Hauiti-Parapara and Paraone crossing the whitewash. Manawatu responded with a try but Losi Filipo powered to the line to seal the semi-final. Hawke’s Bay scored two tries in the first half of the second knockout fixture to lead Taranaki 12-7 at the turn. Hawke’s Bay then scored consecutive tries through Sebastian Visinia and Donaldson to extend the lead to 26-7. Taranaki clawed one back, but a try to Danny Toala sealed the match. Manawatu and Wellington shaded each other throughout the first seven minutes of the women’s final. Manawatu opened the scoring with a strike by Rebecca Tufaga but Ayesha Leti-L’iga knows what the tryline looks like and she blazed through to make it 5-5. Lauren Balsillie ran hard and straight and captain Selica Winiata was on hand to score next for Manwatu at the end of the half. Right after halftime, Monica Tagoai was tackled just short of the line for Wellington but try-scoring rookie Kolora Lemani finished off to make it 10-10. Manawatu put the afterburners on at the end and Winiata scored to re-take the lead after another Balsilie break and then Chrystal Mayes scored again to clinch victory. These two teams had met earlier in the tournament, for a similar result. Lomani scored twice to put Wellington up 12-0, before a Winiata try cut the lead to 12-7 by halftime. The Cyclones side then scored three consecutive tries to take that one 22-12. Pool play saw 15 matches played, all on the number one field. Other players not mentioned above to stand out on the day included Tyrone Dodd-Edwards and Trent Hape (Hawke’s Bay men’s), Liam Blyde (Taranaki men’s), Adam Simpson (Wellington men’s), Randall Bishop (Horowhenua-Kapiti men’s), Inia Katia (Wairarapa-Bush men’s) and Liana Mikaele-Tuu (Hawke’s Bay women’s). The tournament was well-organsied by the Horowhenua-Kapiti union and well-officiated by the group of referees that came together from several provinces.